Size: 37 x 22 x 7 cm. The instrument comes with a shaped case, songbook, tuning key, and stringing information. This portable Pentatonic instrument is a favourite with beginners and children. The Little Minstrel has a soundbox which gives the instrument extra resonance. The Oriental tone has a very relaxing quality, so it is a perfect instrument to put you and your child into a peaceful state before sleep or to accompany a story or lullaby. This is a great instrument for storytellers. You don't have to think of what notes to play. They all work for you! The Little Minstrel is carefully handcrafted and finished with a heart-shaped soundhole. The instrument comes with a shaped case, songbook, tuning key, and stringing information. 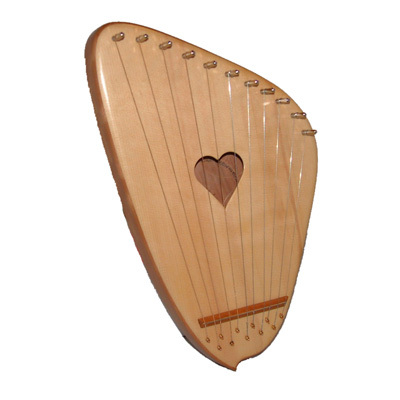 "Since adults want a louder instrument than the Kinder Lyre, the Little Minstrel Harp is the alternative learning instrument (and relaxation agent) for those not yet ready for the larger folk harps (with their 8-note scale). Both the Kinder Lyre and the Little Minstrel encourage improvisation, so almost any plucking, stroking and strumming sounds pleasant. And combinations of all three are possible.